Our Paranormal Reality, a True Haunting. 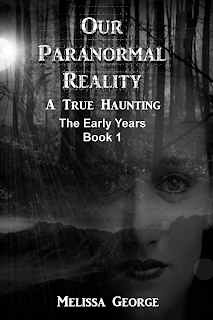 Book 1, The Early Years, Is the actual story of a family dealing with an evil entity. What was first only a nuisance, quickly turns into a haunting of the worst kind. When demonic forces threaten to destroy this family, they begin to fight back. They enter into a battle for their home, their family and their very lives. After dinner one night the four of us sat in the sun room watching TV. At one point we all heard muffled voices coming from down the hall. Matt and Caleb went to take a look. The back door was still locked, and there was nothing out of place, so they returned to the sunroom and we settled back in to finish our movie. All of a sudden the back door slammed so hard it shook the house! Matt and Caleb were on their feet in a flash racing down the hall. Cara and I stood in the dining room, terrified, looking down the hallway. To everyone's amazement, the door was still locked!